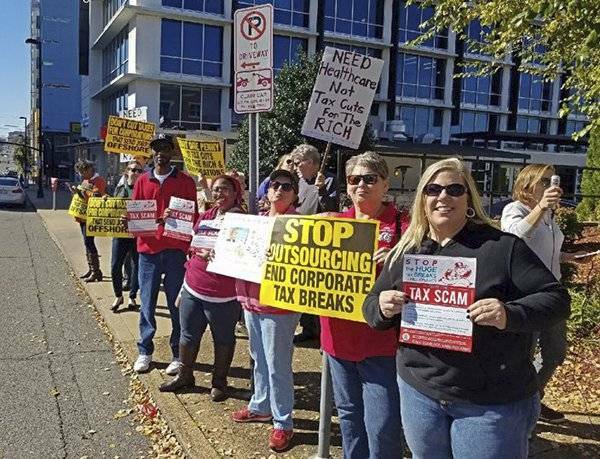 In Nashville, Tenn., workers from CWA Local 3808 and allies rally against the for-rich tax plan outside a Wells Fargo office. Dec. 4 — Faster than a speeding corporate PAC contribution to campaign coffers, the U.S. Senate passed its version of the infamous “tax reform” bill after midnight on Dec. 2. All but one of the Republican senators voted for the bill. The legislation now goes to a joint House-Senate “reconciliation” committee, where both corporate giveaway versions of the bill will be merged into one final bill. The Senate and House each tried to outdo the other in showering favors on the wealthy. Blithely labeled a “middle-class tax cut” by both Trump and these millionaire senators, the legislation is, in fact, a huge giveaway to corporations, banks and the billionaire class. While all the much-touted tax breaks for workers are temporary, the maximum corporate tax rate is permanently reduced from 35 percent down to a measly 20 percent. And for “pass-through” businesses, which are privately owned companies whose profits “pass through” to the owners, the Senate bill allows owners to reduce their taxable income by deducting 23 percent of those profits. This is a favorable change from the current 17.4 percent. And a lot of his billionaire buddies will see their top income tax rate reduced from 39.5 percent to 35 percent, saving them millions upon millions for more yachts, more mansions, more private jets. They even get a new maintenance deduction for those jets. 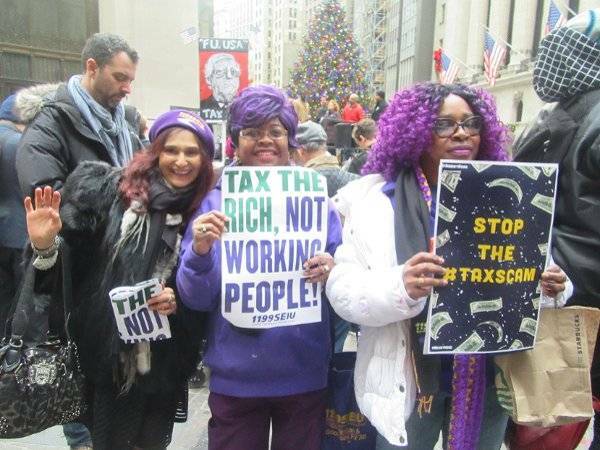 In New York City, union workers march Dec. 1 against new tax plan. But for the workers and oppressed, this tax giveaway for big business, combined with the Trump budget plan, represents devastating cutbacks and a new wave of austerity, all designed to rob the workers and poor to pay the rich. 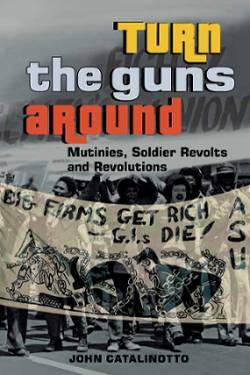 Neither noted that the biggest discretionary item in the yearly federal budget is always military spending. The Senate tax plan ends the mandate for health insurance, which means that premiums will go up, and could cause 13 million people to lose their health insurance. It allows the well-off to use tax-free dollars to fund K-12 private and religious schools, while at the same time it lowers the tax deduction for property taxes, which will put the pinch on public education. In the proposed Trump budget, subsidies for the Affordable Care Act are already slated to be slashed. That budget also calls for a 47 percent cut to Medicaid with a 30 percent cut to food stamps. So workers will be forced to spend much of any savings from their meager tax reduction to pare down their debt. All Democratic senators did vote against the tax bill, saying it is “unfair to the middle class,” and it will drive up the deficit. True enough. But payoffs to military contractors are their real priority. When the massive $700 billion Pentagon budget came up for a vote in November, nearly all Democrats voted for it, even though they know it makes social programs more vulnerable because it will hike up the deficit. Should the Dems regain control of Congress next year, you can be sure what they will say when the next recession hits — and it will. They will tell the workers and oppressed to quietly accept that the Treasury lacks money to rescue them. That’s what the Democrats did in the 2008 Great Recession. That the capitalist system provides tax cuts for big business and its billionaire owners while imposing austerity on workers means that capitalism has failed. Now the wizards of high finance can no longer rely on their “normal” exploitation to generate enough profits. Out of desperation and greed they have directed their minions to squeeze the working class harder to fill their vaults.